Distributors: 10452459 - Distributor Cap V-8, 5.7L. from California Marine. 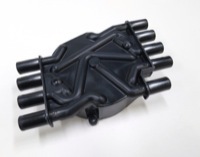 Description Distributor Cap V-8, 5.7L. The MSD 6M-2 Ignition is designed for performance marine applications where a high energy and reliable ignition is a necessity. The capacitive discharge (CD) multiple sparks from the 6 series circuitry ensures easier starting, more power and reduced plug fouling while idling. The MSD 6M-2 has several features added to deal with constant high rpm and load conditions common with marine applications. Weathertight Connectors with multi-ribbed seals are used to make the electrical connections to the 6M-2. The unique design of the weathertight provides reliable connections that are unaffected by water, oil, gasoline and most other chemicals associated with boats. To protect the 6M-2's electrical circuitry from direct water contact, the entire unit is potted with Dupont Restech compound. This material prevents the electrical components from coming into contact with water or other chemicals that could cause damage. The 6M-2 can be triggered by either a magnetic pickup (distributor or crank trigger), amplifier or by a breaker point distributor. The cable harness has the proper connector so you can plug the 6M-2 into one of the Pro-Billet MSD Marine Distributors.